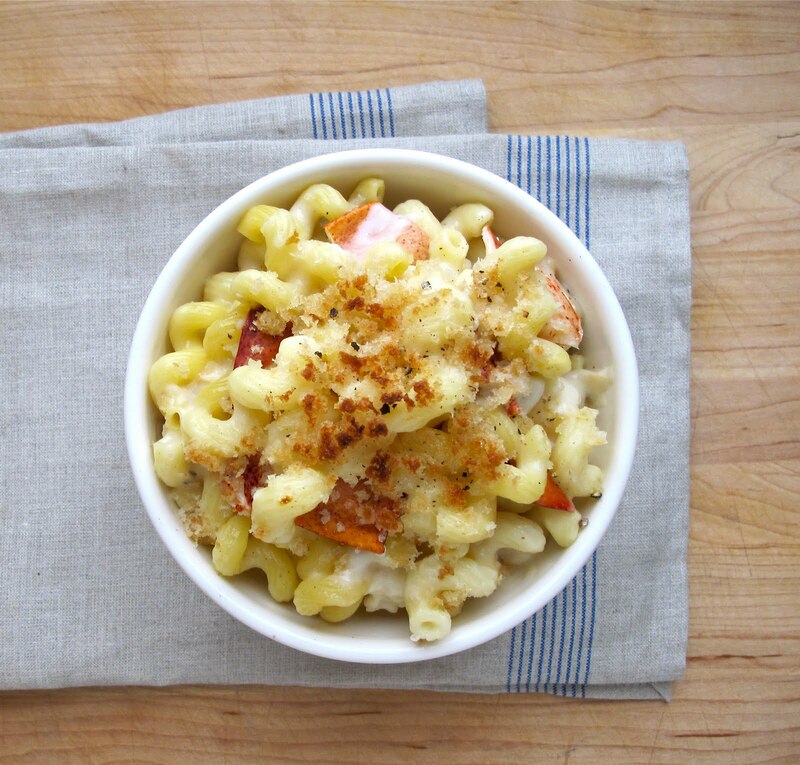 I always thought that Lobster Mac & Cheese was just too indulgent to make at home. It seems like something so frivolous, financially indulgent and, well, a waste. In Boston (our new temporary home - more about that later! 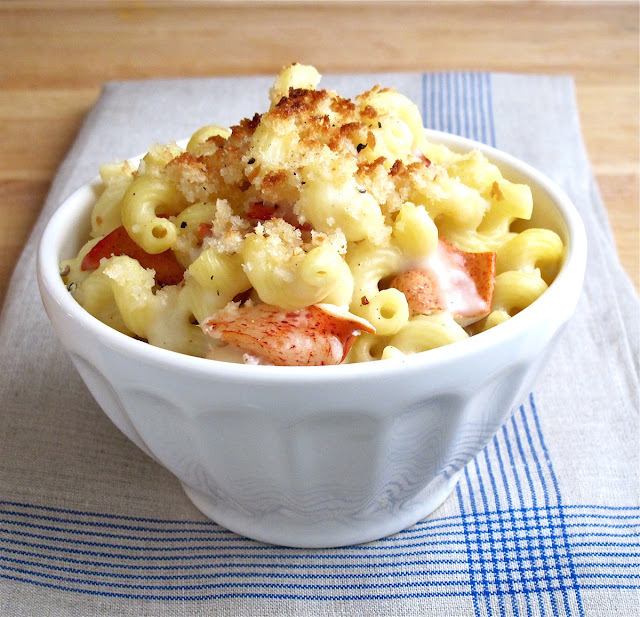 ), Lobster Mac & Cheese is everywhere - on every menu. I see it on menus more often than I do 'Chowdah.' Most menus have it listed for $25. Yikes. I calculated that I would be able to make enough for 2 large servings for less $25. It still blows my $10 dinner budget, but it is a great splurge for a Saturday night dinner. After some research on "The Best Homemade Mac and Cheese" recipes, I decided to use The Barefoot Contessa's recipe as a starting point. I used white cheddar, gruyere and added some colby jack to balance the flavor of the stronger cheeses. I bought a live lobster and steamed it at home, but that is not necessary. Actually, I really didn't like cooking the live lobster - I know, I know we all need to be conscious of where our food comes from, and be conscious that eating meat is actually eating a once live animal... but, I think I'll just buy it pre-steamed next time. Remove the meat from the claws and tail of the lobster. Discard the shell (or save to make stock). Cut the meat into 1 to 1/2 inch pieces. Begin by boiling a large pot of water - add 2 tablespoons of sea salt. When the water has reached boiling, add the pasta. Cook for 6-7 minutes. I like to cook pasta 2 minutes shorter than the directed time on the package, in general. For the cheese sauce, begin by making a simple white sauce* by melting 3 tablespoons of butter on medium in a heavy bottomed sauce pan. Reserve the remaining 1 tablespoon for the breadcrumb topping. Add flour to the butter, stirring with a whisk. Stir and cook over medium low for 1 minute, until flour is cooked. Pour in milk, stirring until smooth. Cook over medium high heat for 5 minutes until the sauce has thickened. *You've just made a roux, a basic white sauce! Most bisques, chowders, cream sauces are made from a roux. Remove the sauce from the heat. Add all of the grated cheese and stir until smooth. Add pasta into the cheese sauce and stir to coat. Add the lobster in and season with salt & pepper. Distribute into 2 oven proof bowls. To make breadcrumbs, tear the 2 slices of bread into a food processor. Whirl until evenly crumby. Melt the remaining 1 tablespoon of butter in a small bowl, then add breadcrumbs and toss with the butter. Crumble the breadcrumbs on top of the pasta. Broil the mac and cheese for 1 -2 minutes until the breadcrumbs have browned. Sounds heavenly and totally worth the extra money! mmmmm....you're right! i've been seeing this everywhere lately for the cost of an arm and a leg. I like your modified recipe, but a roux is not a white sauce - the roux is the combination of fat and flour that forms the basis (thickener) of a white sauce (and other sauces).